I was in the grocery store a week or so ago and I was looking at the chocolate chips. When I noticed the mint chocolate chips and I thought that I really should buy a bag. Now this is not the first time I have noticed them, yes I have seem them sitting on the shelf, actually I think they have been calling my name when I walked past them. I have ignored them until that day, when I really wanted to have my fix of chocolate and mint. See I think that chocolate and mint go hand in hand, like peanut butter and jelly or corn on the cob and butter. A match made in heaven. The next thing was what to make with these yummy mint chocolate chips? I decided upon some fudge brownies with a mint frosting and a chocolaty mint glaze for drizzling over the frosting. 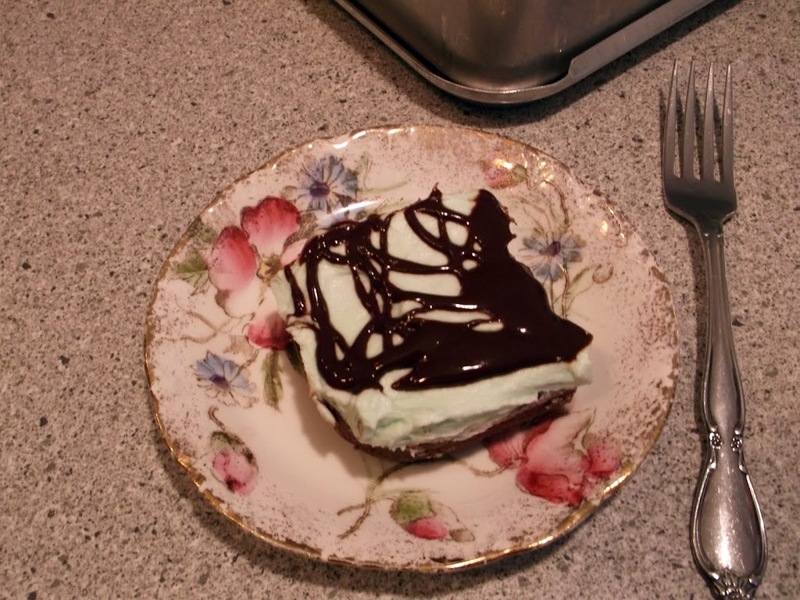 Yes I know it does seem like a lot of mint in this dessert, but believe it really did work. No complaints from the people that ate them and that included myself. So if you like mint like Mike and I do with a scrumptious brownie I hope that you will try these brownies. I am sure you won’t hear any complaining from the people you make them for also. In a medium saucepan melt butter and cocoa. Remove from hear; stir in sugar. Blend in eggs one at a time. Add vanilla. Stir in flour and mint chocolate chips; mix well. Spread batter into a 9×13 pan. Bake at 350 degree F for 30 minutes. Be care not to over bake. 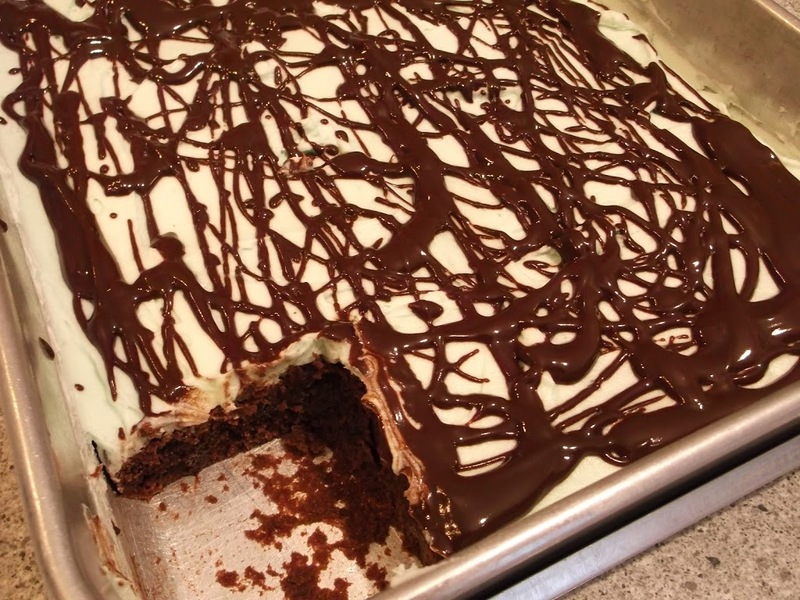 Once the brownies are completely cooled take you favorite vanilla frosting and add 1/4 teaspoon of mint extract. You can add more or less depending on your taste. I used a frosting that I posted a while back ago; it was my mother-in-laws never fail butter cream frosting. I added a few drops of green food coloring for some color and this frosting was ready to go. For the chocolate mint drizzle I took the remaining 2/3 cup of chocolate mint chips, 2 teaspoons of corn syrup and 1 tablespoon of milk added that all together and melted it over a low heat on the stove, stirring constantly. 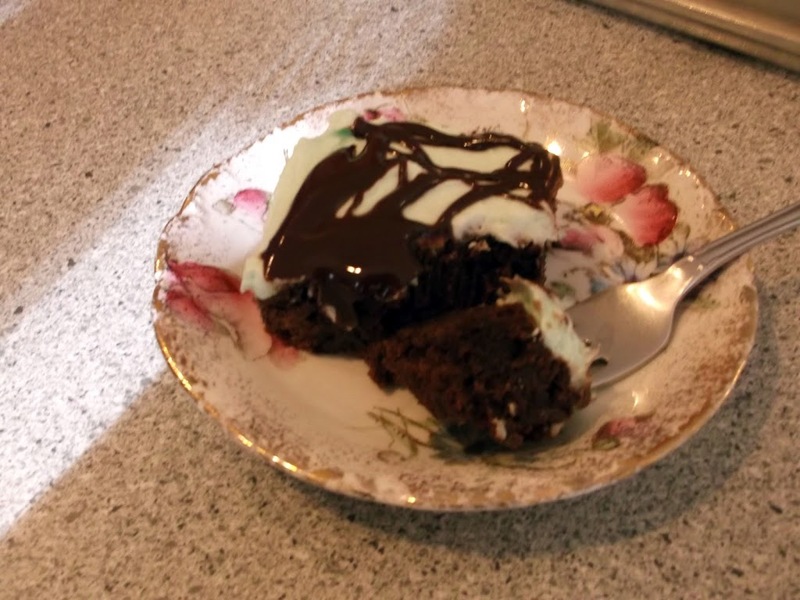 Once it is completely melted drizzle chocolate over the frosted brownies. I never bake with mint and I can see I’ve been missing out! They look insanely delicious! I’m a sucker for brownies. Wow, wow, wow. I am totally drooling right now.